You may receive updates from Ready to Fight, Progressive Kick, and Women for Bernie, the sponsor of this petition. 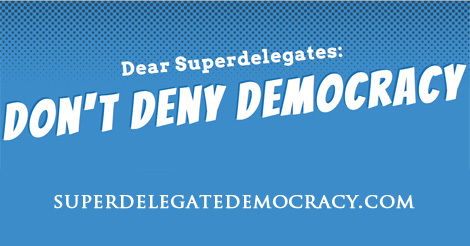 Superdelegates are special voters that the Democratic National Committee gives special power to in determining the Democratic presidential primary. We are supporters of Democracy in Alaska, participating in the Democratic primary, and concerned about superdelegates swinging the results of what real people actually voted for. Alaska has 4 superdelegates at stake. No matter who you support, it’s time to make sure democratic elections results aren’t subverted by backroom politics in Alaska. Commit to honoring the voters – let everyone know that you won’t allow your vote to defeat our votes in Alaska. Announce that in the event of a close race, you’ll align yourself with your fellow citizens – not party elites.